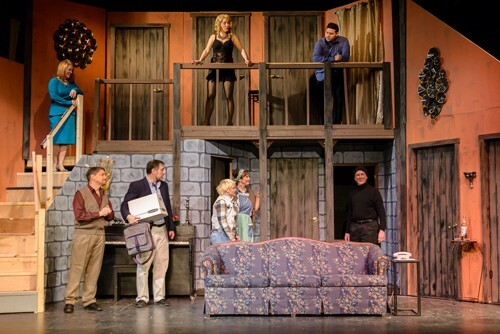 The Silhouette Stages is community theater at its best, illustrated by its current production of the 1982 farce, Noises Off, written by Michael Frayn and directed by Conni Ross. This award-winning and Tony-nominated play is one of the most technically difficult and physically challenging for any company – and one of the funniest. The show is currently making a successful revival at New York’s Roundabout Theatre but this local cast and crew could stand toe-to-toe with any professional production of this play. This play-within-a-play has its own program in the back of the actual program for the fictional production called Nothing On, with Monty Pythonesque biographies of the “actors” and fake, comical ads. Anyone who has ever performed in theater – in school, community theater, or professionally – will understand all the behind the scenes antics and drama of putting on a play. Noises Off is in three acts but each is listed as same Act One of the other play, though in different locations on the tour. Noises Off begins as small theater company is going through the final dress rehearsal before their opening. They are launching a national tour around the lesser-known towns of England. This is clearly not a top-notch theater company and the script is mediocre. Director Lloyd Dallas (Gary Reichard) is sitting in the theater making sarcastic comments from the seats and is often forced to come to the stage as the cast stumbles through its lines and stage direction. Dotty Otley (Mirbeth Vogel) is a playing Mrs. Clackett, a maid who seems to have difficulty with a plate of sardines, which becomes a comic focal point in the show as well as the many doors in a complex, two-level set with a staircase. It doesn’t matter what the play is about for they never get past Act One. The very nervous and exhausted company and stage manager, Tim Allgood (Adam Abruzzo), is on call in case Seldon Mowbray (Don Patterson) – the cheerful company drunk who plays a burglar – doesn’t show, or shows up less than sober. Poppy (Parker Bailey Stevens, sporting a spot on Irish accent) is the assistant stage manager who seems to have gotten her job thanks to her father – the chairman of the theater company’s sponsor. She is also in love with the director who is cheating on her with the clueless, self-absorbed Brooke Ashton as Vicki (Allie Dreskin). Brooke spends most of the production in her underthings and preening herself when not performing. In the fictional play, Brooke is coupled with Gary/Roger Tramplemain (Ryan Reichard) who has brought her to the house for an afternoon tryst. When the owners, Philip and Flavia Brent, sneak home from their self-imposed tax exile in Spain, the comedy of errors as is Nothing On are layered on to the missed cues and technical mishaps of the actors. Julie Press as Belinda/ Flavia and Jeff Dunne as Frederick/Philip are delightful as the couple but it is Dunne who is so masterful at physical comedy as the clumsy but sweet actor prone to nosebleeds. It is during a nearly disastrous matinee when the audience witnesses the production from backstage. More of the company’s personal relationships are revealed – the jealousies and misunderstandings as some of the actors go after each other while simultaneously putting on a show. Kudos go to the cast for their exhausting juggling act as director Ross choreographs a masterful ballet of fast-paced, slapstick action that continues in the final act when it all completely and hilariously comes apart. The set is an architectural marvel with two levels, seven doors, a curtained exit to an attic and a window also used for access. High praise goes to the set designer Alex Porter and his crew. The massive set must be rotated twice during the show and it is a herculean task. The cast also deserves praise for mastering British accents, sometimes two different dialects, as the actors and then as their characters. If you love theater and are looking for any evening of laugh-out loud fun, Noises Off at Silhouette Stages is a best bet – and don’t forget the sardines! Noises Off runs through March 20, 2016 at Silhouette Stages, Slayton House Theatre in Wilde Lake Village Center, 10400 Cross Fox Lane, in Columbia, MD. For tickets, call the box office at 410-637-5289, or purchase online.